Look down on Hayman from the air and its pool is a glittering central sapphire, a hexagonal jewel surrounded by an endless ring of blue. This pool is seven times Olympic size, so large they call it a lagoon. 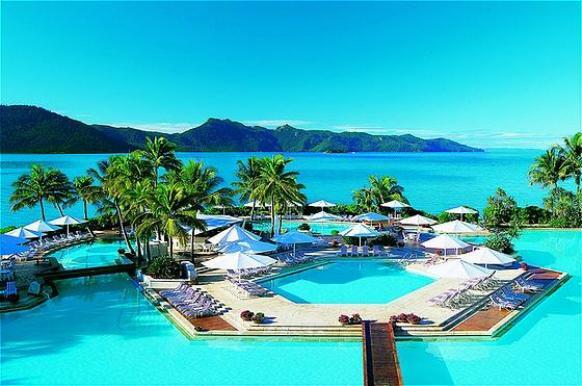 For the best views of the blue The Luxury Travel Bible loves Hayman's penthouses on level 4 of the Lagoon Wing which overlook the Lily Lagoon, Lagoon Pool, Hayman Beach and the Coral Sea beyond. We're also fond of the butler service and exclusive use of the Penthouse Lounge. A sedate swim around the perimeter pool through a watery maze spanned by bridges will be enough to exhaust you for the day. Just point us in the direction of the poolside loungers and a reviving cocktail please.